But sometimes things are truly tragic. Anything even resembling eloquence becomes impossible, and the most articulate thing I can say at such times is, “What a week,” and I don’t mean it in a good way. So let me repeat: What a week. My first draft of this sermon included a litany of all that happened. But I couldn’t finish it. Because I couldn’t possibly name all the horrible things that happened this week. Because it upset me far too much to put it in writing. I said it summed the week up imperfectly, because it didn’t mention the rich and famous and powerful all losing their jobs due to past sexual harassment. Matt Lauer I could deal with. But not Garrison Keillor. But all kidding aside, I don’t know that I’ve ever felt this hopeless. Even when somebody I love has died, I can be filled with hope. But if my hope is in Christ—and it is—then in what can I hope if it is supposedly in the Name of Christ that the rich are favored, the interests of children ignored, and the sick and the elderly left helpless? Is there comfort in the fact that this is not the first time in the history of the world that society has strayed from the path of Christ even while proclaiming his Name? I suppose so. First of all, Jesus did say that not everyone who calls him Lord will enter the kingdom of heaven, but only those who do God’s will. But even more comforting is the knowledge that if we truly want to meet Christ, we meet him here, at the table where our host is the very One who was conceived by a woman that society would have punished, born in a stable, started out life as a refugee, was despised and rejected by others who held him of no account, and who in the end was executed as a criminal. But why is it his death we remember here, and not his resurrection? It is because we come here to gain strength for the journey. This meal is a heavenly banquet, but it’s held in the valley of the shadow of death. In remembering his crucifixion, therefore, we not only sanctify our own suffering by receiving him in the midst of his suffering, we also receive the promise of God’s strength—a strength that can overcome anything in life or death; anything in the difficult present, in our own sinful pasts, or in an uncertain future. So come to the table, all you who despair because of the injustice that surrounds you in the world, for here you will be nourished in hope and strengthened for the journey ahead. Come to the table, all you who fear the next hammer blow, for here you will be fed in peace—not the shallow peace the world gives, the peace that lasts only as long as the powerful remain sated—but the peace of God which passes understanding, which grants us to both lie down and sleep in peace, knowing that Christ comes to set right that which is wrong, and that in this supper we are fortified to be his co-workers. Come to the table, all you who are downcast, for here you will feast on joy—a joy that is lifted up even in the midst of pain, for the promise of God brings down the powerful from their thrones, and lifts up the lowly. At this table, the hungry will be filled with good things, while those who feed themselves on that which was intended to be shared by all will be sent away wanting. 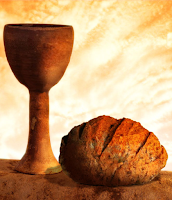 Come to the table, you who are lonely, you who are bereaved, you who are despised, for at this table your banquet will be the very love of God, who will also strengthen you to the end, so that you may be blameless on the day of our Lord Jesus Christ. God is faithful; by him you were called into the community of his Son, Jesus Christ our Lord [1 Cor. 1:8-9]. Amen.